A decoder that has two inputs, an enable pin and four outputs is implemented in a CPLD using VHDL in this part of the VHDL course. This 2 to 4 decoder will switch on one of the four active low outputs, depending on the binary value of the two inputs and if the enable input is high. VHDL processes are introduced in this tutorial – processes allow sequential execution of VHDL code contained in them. 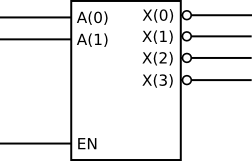 The block diagram of the two to four decoder is shown here. The two to four decoder is implemented with the following VHDL code. This code does the same thing as the previous code, but compensates for the inverting inputs of the home built CPLD board. The inverting outputs are left as-is because they are active low and an LED will switch on, when one of the outputs becomes active. This video shows the above VHDL code implemented on the home made CPLD board. The source code for the 2 to 4 decoder can be downloaded here. The UCF and JED files are configured for the home made CPLD board. The decoder is implemented within a VHDL process. The code in a process runs sequentially, unlike the normal concurrent behaviour of VHDL. A process in VHDL starts with the VHDL process keyword followed by parentheses: (). The parentheses contain a sensitivity list – the process is executed every time a signal in the sensitivity list changes. The decoder uses the VHDL if keyword. An if statment is used in the process that allows one of the outputs of the decoder to be active only if the enable (EN) signal is high. An if statement is started with the if VHDL keyword followed by parentheses that contain the conditions being evaluated. Only if this condition is true, the code between the then keyword and the end if; statement is executed. This is the first line of code that runs in the process. If EN is 0, then the code in the if construct will never run and the X outputs will always be high. If EN becomes high (logic 1), then the code in the if construct will execute. The case statement operates sequentially and can only be used inside a sequential block of code such as a process. One or more when statements are contained in the case construct. In the decoder, the logic level of 0 is applied to the selected output (using X(?) <= '0';) when the A input matches one of the binary values in the when statements. The default when others statement is necessary even if all the possible binary input combinations have been taken care of by when statements.